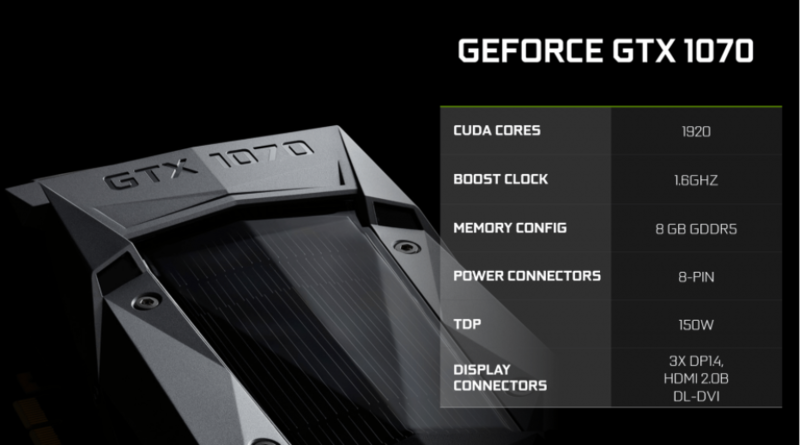 On May 6 NVIDIA unveiled its two flagship Pascal video cards – the GeForce GTX 1080 and the GeForce GTX 1070 but the company published the tech specs of the GTX 1080 model only leaving millions of gamers wondering what the GTX 1070 would bring. We knew well in advance the GTX 1070 would be slower than the GTX 1080 and this can be seen in the name of the graphics card but how much slower will the GTX 1070 be? We now have the answer to this question – the Videocardz web site has published the tech specs of the GeForce GTX 1070. According to the provided information the GTX 1070 will come with a cut-down 16 nm GP104 GPU that will feature 15 SMX units enabled out of a total of 20. This means that the GTX 1070 will have 1920 CUDA cores, 120 TMUs and 64 ROPs. The card will sport 8 GB of GDDR5 memory at 7000 MHz with a 256-bit memory bus for 256 GB/sec of memory bandwidth. The nominal GPU speed is unknown but the GP104 chip will reach a maximum Turbo Boost GPU frequency of 1600 MHz. The GTX 1070 will reach 6.75 TFLOP/s of single-precision floating point performance and will come with TDP of 150 watts. The card will require additional power from an 8-pin power connector and will offer support for 2-way SLI as well as three DisplayPort 1.4 connectors and one HDMI 2.0b port. The cut-down GPU should then deliver at least 20 per cent less performance compared to the GTX 1080. The GeForce GTX 1070 will debut on June 10 this year. The card is expected to sell for USD 379.